It's been a couple days now and I'm still buzzing from the two Green Day shows earlier this week. I feel more like a teenager than I did when I actually was one. 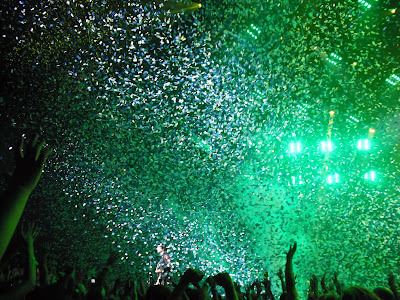 Back in May I said that Green Day's Webster Hall show was possibly the best I'd ever seen, but I must admit that it paled into near-insignificance compared with the spectacle I witnessed at Madison Square Garden. I've never been a big arena rock kind of guy; most of my MSG-type shows were in the 60s and 70s and involved the likes of the Rolling Stones, David Bowie, Led Zeppelin, etc., and as I think I've noted, I'd only been to Madison Square Garden itself once before, on July 28, 1973, the night Led Zeppelin were being filmed for The Song Remains The Same (and, incidentally - though I still maintain I had nothing to do with it - the night they were robbed of their share of the box office receipts, some $300,000, which, believe it or not, was quite a bit of money in those days). In the 90s I saw Green Day play at Wembley and Oakland Arena, but both experiences left me, if not cold, at best slightly lukewarm. Maybe it was because on both those occasions I was up in the seats looking down on the arena floor, whereas this time I was on the floor, only a few feet from the stage. But to be fair, the floor itself was a very different affair for these shows; in Green Day's early arena-rock days, nearly anyone who wanted to be on the floor could get there, and the result was a seething, swirling maelstrom of flying bodies and - sometimes - flailing fists as thousands of people struggled to cram themselves into a space that could comfortably fit no more than a few hundred. This time, the standing room near the stage was tightly controlled, accommodating, I would guess, about 500 people and leaving plenty of room to wander around or stand quietly if you weren't among those who simply had to be face-to-face with the band. When I say tightly controlled, put it this way: our way was barred by a snarling MSG security guard even though we were wearing passes that allowed us to go pretty much anywhere backstage. We had to spend the first part of the show a few hundred feet back, until the wonderful Carly intervened. Carly was there to look after the several children who were traveling with the band, and for purposes of getting to where we wanted to be, we became, essentially, three more of her charges. She escorted us up to the front, patiently explained to the security guard that she was responsible for us, and turned us loose into what might have been the ultimate punk rock playpen. I don't say that disparagingly, either. Oddly enough, it felt a bit like being at Gilman (which also was described as a playpen or "punk rock Romper Room" by those who felt it wasn't truly punk if limbs, teeth and blood weren't at risk). There were almost none of the boneheads whose idea of a fun show involves beating up those smaller than themselves, and almost everyone right up front knew and loved the band's entire catalog, from 1988 to the present, well enough to sing along all the way through, and to cheer ecstatically when some of the long-neglected songs from the first two albums were resurrected. It wasn't until I got home, till the next day, actually, that it occurred to me that those sitting up in the seats, especially in the upper balconies, would have had a very different experience, and that the almost intimate little concert we enjoyed at the very front was only possible because the vast majority of the audience was barred from being there. But it really did feel intimate. At times, like when Billie was out at the end of the catwalk that protruded into the crowd, we were actually behind him, looking out at the audience from a very similar perspective to what he was seeing. And I found myself thinking, "This place isn't that big, in fact it feels almost kind of cozy." Of course, a great deal of this is probably down to Billie's ability - whether he's bellowing AY-O and insisting that people put their hands in the air, or singing a heartfelt ballad accompanied only by an acoustic guitar - to connect with people throughout the amphitheater, those marooned far up in the nosebleed sector as much as those standing awestruck at his feet. I've often spoken and written about how, when I first saw Green Day (then known as Sweet Children) playing for five kids in a candlelit cabin in the Mendocino mountains, Billie performed like "the Beatles at Shea Stadium." Even though he was just 16, and the band was playing only its third or fourth show ever, I could, I thought, easily envision them displaying the same commanding presence on the biggest stages in the world. It seemed like a crazy idea at the time, and most people I told about it laughed at me and/or told their friends that I was losing my mind. Well, I may not have been right about many things in my life, but I think I nailed this one. I've seen Green Day in bigger venues - headlining the 2004 Reading Festival, for example - but I've never seen them or any other band so thoroughly command a stage and an audience. The Rolling Stones at the LA Forum in 1973 might have come close, and Alice Cooper at Cobo Arena in 1971 made a good stab at it, but... ah, I can think of one performance that might have given Green Day a run for their money: the Who at Woodstock in 1969. But while that performance might have contained moments of grandeur and majesty that surpassed what Green Day produced at the Garden this week, it was also diminished by lulls, longeurs, and the simultaneously satisfying and upsetting spectacle of Abbie Hoffman getting knocked cold by Pete Townshend's guitar. There have been times in my life when I was enough of an unbearably punk purist to turn my nose up at the elaborately produced and tightly choreographed sort of rock show that Green Day have now honed to a fine art, but that's just one of many ways in which I've succumbed to the prevailing idiocy rather than think and judge for myself. When I went to see La Traviata at the Sydney Opera House, I didn't complain that the production was too ornate or expensive, or that the sound was too slick and clean; instead I marveled at how the talents of the set and costume designers combined with those of the composer, the performers, the sound and lighting engineers, even the ushers and ticket takers, to create a living monument to what was bright and glorious about not just art and civilization, but to the very essence of what it is to be a human being: the desire, no, the need, to constantly transcend oneself. Okay, before I risk climbing any further into the heights of grandiloquence, let me point out that, yeah, dude, this show also totally rocked and they played (almost) all my favorite songs, etc. I was especially ecstatic to, early on, hear the opening chords of "Holiday", which was noticeably missing from their New York shows in May. In fact, that's exactly when the feeling kicked in, the one that let me know I was in for one of those shows that I would remember and treasure all my life. What more could I have asked for? Well, "Christie Road" would have been a thrill (he did sing a couple bars of it during his "Shout" breakdown near the end, and on Monday night Nate Doyle and I were screaming like crazy for "Dry Ice", a song I've been (mostly unsuccessfully begging them to play ever since they dropped it from their repertoire sometime in the early 90s. 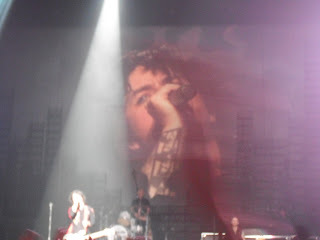 Someone also threw an outsized pair of men's briefs at Billie, on the back of which was emblazoned "No One Knows". It was going to happen, of course, but it was a sentiment I heartily endorsed; for many years I cited it as my favorite Green Day song ever. But between the two nights we did get to hear "Going To Pasalacqua" (aka "Here We Go Again"), "Who Wrote Holden Caulfield", "2000 Light Years Away", "Welcome To Paradise", "Disappearing Boy", and a not nearly so old, but equally unexpected treat, "Macy's Day Parade", enough to satisfy all the most curmudgeonly old school Green Day fans (there are still some who bristle any time the band plays anything newer than Dookie, but since American Idiot and 21st Century Breakdown are my favorite Green Day albums of all, I had no problem at all with hearing much of the former and most of the latter. The band played two hours and forty-five minutes on Monday, which cost them quite a bit of money, since they were heavily fined for going past the Garden's curfew. So I halfway expected them to cut things a bit short on Tuesday. Instead, they played almost three full hours. There are not many bands - in fact, of the bands active today, I can't think of any - who could pull this off. I usually get impatient when a band goes over 30 minutes, unless it's one with a lot of history and hits behind it, in which case I can stretch to 45 or 50 minutes. But not since my days of watching the Grateful Dead on seven hits of acid have I voluntarily subjected myself to multiple hours of of one band's music, and yet I could easily have watched at leat another half hour of Green Day. More that that if they'd dug up some of the more obscure gems from 39/Smooth, Slappy, 1,000 Hours and Kerplunk. I've already commented on the inspiration provided by Stephanie's guitar playing on "Jesus Of Suburbia" (and was totally stoked when she responded to my blog entry! ), but her star turn shouldn't obscure the fact that nearly a dozen other kids were invited up on stage over the course of the two nights, and all - all but one, I should say - acquitted themselves magnificently. So much so that many people have expressed suspicion that these little guest spots are planned in advance, but it's just not true: Billie indeed does pick people right out of the audience. His wife was telling me how he's developed a real sense for who is up to the task and won't succumb to crippling stage fright. The boy who looked to be about 12 or so and played bass on "Longview" showed no such tendencies; before he was halfway through the song he was tearing around the stage as if he'd been born on one, and at the end jumped up to the mike and shouted, "Thanks, Madison Square!" He also walked off stage with a brand new bass, courtesy of Mr. Dirnt. On Tuesday night, my friend Jim Kim was standing more or less behind me for the entire show, and he's posted this portfolio of photos that should give you an idea of what things looked like from where we were. However, the photo above was taken by my 13 year old nephew, Jackson, who, despite it being his first attempt ever at photographing a big rock concert (and using my new camera for the first time ever), produced a number of pictures that totally eclipsed any of my efforts. To be fair, on Monday night, when I had the camera, I wasn't quite close enough to get any really good shots, and on Tuesday night, when I was, Jackson had the camera, but was farther back engaging in kid-type shenanigans with the Armstrong boys and other members of Emily's Army. I never saw any kind of show until I was 16, so I can't even imagine what it was like for him, but as far I was concerned, if there was anything greater than seeing Green Day at the height of their glory, it was being able to share that experience with my completely awesome nephew. And, late-breaking development: almost as if he'd been reading my blog, Billie busts out his acoustic guitar and delivers a partial (all but the final majestic bridge and chorus) rendition of one of the greatest Green Day songs ever, "Christie Road". It's got to be only a matter of time before the full electric version once again becomes a concert staple. To all of you out there in lands where this Green Day tour hasn't yet arrived, I beseech you: put aside any prejudices you may have against "big" or "commercial" or "arena" type rock shows and do whatever is necessary to witness this one. Miss this and I can virtually guarantee that a couple decades from now your kids will be hitting you with the mid-21st century equivalent of, "Mom/Dad, how could you have been so unbelievably lame?" Reminds me a bit of the late 70s/early 80s, but in a good way. Much has been said and written on the subject of empowering young girls to take their rightful place in the traditionally male-dominated rock and roll world. My friend Jessica Hopper has recently published The Girl's Guide To Rocking, which appears to be getting a great reception, and deservedly so. But Monday night at Madison Square Garden, I saw Green Day and - more importantly - a girl called Stephanie do more for the cause of girls rocking out than all the riot grrrl bands in history laid end to end, and sorry if that sounds like a poor choice of words, but I honestly didn't mean anything salacious by it. Those of you who follow Green Day will be aware that it's a long-standing tradition to invite audience members up on stage to sing or play instruments on some of the songs. Back in the 90s, most of the invitees would be boys, but nowadays the gender balance tends to be pretty equal. What people may not know is that those invited up are not chosen in advance; Billie picks them out of the audience based on his gut feeling as to whether they'll be up to the task. Monday night he was looking for someone to play guitar on "Jesus Of Suburbia," a nine-minute rock epic with multiple chord and tempo changes. Much as I - like, no doubt, a million other fans - have occasionally harbored fantasies of jumping on stage with the band (I've actually played guitar with Billie in the studio once, back in the Neolithic era, but never on stage), I found myself ducking behind somebody else when he was recruiting a JOS guitarist, because there's no way I could play that song sitting alone in my room, let alone in front of 20,000 people. But Stephanie swore she was up to the task, and boy, was she. She was so at ease with her guitar that before long she was wandering the stage just as the Green Day guys do, and singing along with Billie on the lead vocals. At the end, Billie got down on his hands and knees in front of her and did the "I am not worthy" bow, before leading all of Madison Square Garden in a "Steph-a-nie" chant. I can only imagine what it must have been like for Stephanie, who, with her torn Misfits shirt and matter-of-fact attitude, didn't look like the kind of girl accustomed to being on the receiving end of wild adulation, but she took it in such stride that I'm inclined to think of it as a life-changing experience. Look it this way: from now on, any boy unwise enough to taunt her to the effect that "chicks can't rock as hard as guys" or somesuch similar foolishness can quickly be put in his place with a well-timed, "I had Madison Square Garden in the palm of my hand; what the hell have you done, sucker?" There's also a nice little blurb about it in today's Times. I wasn't there, so I have no way of knowing if, as President Obama claimed, the Cambridge police "acted stupidly" in arresting Harvard professor Henry Louis Gates, but I feel pretty safe in saying that Obama spoke stupidly in making this apparently off-the-cuff comment. It's the first time I've seen the Prez seriously blow it in terms of both leadership and public relations, and while George Bush could and frequently did manage half a dozen bigger gaffes in the course of a 10 minute press briefing, Obama's shoot-from-the-lip not only gave his opponents a valid talking point with which to lambaste him; it diverted precious time and attention from the far more vital matter of health care reform. To his credit, the President apologized - well, almost - for speaking out of turn, and will probably, with his invitation to the police officer and the professor involved to meet him at the White House for a beer, end up turning the whole business to his and the nation's advantage. Nonetheless, if I were Obama, I'd have apologized even more forthrightly, or, better yet, not made the remark in the first place. When asked about the controversy at his press conference, an appropriate answer would have been, "I honestly don't know enough about the matter, and what's more, Professor Gates is a friend of mine, so anything I did say would probably be biased." He managed the second part all right, but totally blew it on the first. I don't personally know much about Professor Gates, either, but from what I've read, his behavior was a throwback to another time, almost another era, and while he may not have created the unhappy situation, his hostility and hauteur (that's a fancy word for "Do you know who I am?" syndrome) almost certainly exacerbated it. Trying to turn a case of mistaken identity into a racial incident (or evidence that we are living "in a police state," as one of the lefter-that-left whiteys on the Counterpunch site had it) would of course come naturally to someone whose entire career revolves around uncovering ubiquitous examples of structural racism, but it's too bad the President had to buy into this 20th century sort of thinking. Put it simply: anybody, even the most uneducated street bumpkin, should have enough common sense not to hurl verbal abuse at armed police officers, especially when they are there looking after your interests (stopping people from breaking into your home presumably being one such interest). When a Harvard professor, who leads a life far more privileged and comfortable than that of most Americans, regardless of race, behaves like such a bombastic blowhard, it's not necessarily an arrestable offense - okay, not an arrestable offense at all - but it's hard not to sympathize with the police officers, who lay their lives on the line for a fraction of the pay and benefits enjoyed by Professor Gates if they lost their patience with his foolishness. Well, everyone involved now seems to be saying that this is a "learning opportunity," a "teachable moment," and I'd like to believe that, too. I'm not naive enough to think that racism has entirely vanished from our society just because we have a black President, but neither do we need to continue searching for racism under every rock the way a previous generation did with Communism. For Gates to try and turn his ill-tempered reaction and the police's overreaction into a racial incident (for crying out loud, at least one of the "racist" officers was black) was both dishonest and counter-productive. I'm sorry the President bought into it, glad that he saw and corrected his error, and now can we move on and fix this accursed health care system? You've probably heard me tell this story before, but it bears repeating: how I encountered my first issue of Cometbus. It was sometime in the winter of 1985-86, and I had been walking and riding buses around San Francisco distributing issues of Lookout magazine to the various stores and hangouts where they were welcomed or at least tolerated. The bus was nearly empty, so I took my time walking down the aisle, deciding which seat I wanted to sit in. The ride only took five or ten minutes, so it was kind of ridiculous making a big production of it, but that's the way I was in those days. About two thirds of the way to the back of the bus, I saw a little xeroxed magazine lying on one of the seats, and immediately knew that that was the seat I had been looking for. That was my introduction to Cometbus, and it was only a matter of weeks, if that, before I met its creator, also known as Cometbus, first name Aaron, at Violent Coercion/Youth of Today show at the New Method warehouse in Emeryville. I asked him how his magazine might have ended up on a bus seat in San Francisco and he told me, "Oh, I sometimes leave copies lying around in hopes that somebody interesting will find them." This didn't sound at all crazy to me, since I had been doing the same thing with Lookout. By then Aaron had already been publishing Cometbus for something like five years (he was fond of pointing out that it predated Maximum Rocknroll; if my calculations are correct, it's now only a year or two shy of marking its 30th year in print. In recent years, some issues have taken the form of short novels, and that is the case with the newest one, #52, "The Spirit Of St. Louis". Having read almost every issue Aaron has published, I can unhesitatingly say that this is one of the best. He returns to the subject matter he's best known and loved for, the trial and travails of a bunch of marginal punks struggling to eke out an existence or an identity or at least a place to hang out and put on shows. While many of Aaron's past efforts in this vein have come across as thinly veiled romans à clef (those of us who knew him could usually pick out who was supposed to be who within the first few pages), this newest one is more clearly fictional and - ironically - more realistic because of it. I'm pretty sure Aaron never spent enough time in St. Louis to have created the world portrayed here out of anything other than his vividly creative imagination. And he'll probably call me tomorrow and say, "What, you didn't know about my St. Louis years?" And I'll have to say, no, Aaron, I really didn't. Enough of that, however; if you're any kind of Cometbus fan, you'll be wanting to read this straightaway, and if you're not familiar with the Cometbus oeuvre, this would be an excellent place to start. You can order it through No Idea or any number of other distributors; if you're insistent on doing it the old-fashioned way and don't mind waiting a while, you can always write to the official Cometbus address, PO Box 4726, Berkeley CA 94704. Price? It says $3 on the cover, and I'd throw in at least another dollar for postage. It's been a while since I've done mail order, so don't quote me on these prices. But Cometbus #52: it's a winner. Get it. The unsurprising news that once again California can't agree on a budget and/or come up with enough money to pay even its most essential bills has Time Magazine wondering if the federal government needs to step in, i.e., if the nation's biggest state is, like AIG and Citibank, "too big to fail." The article sketches out two grim scenarios: if the feds let the fruit, nut and flake state go its merry way to perdition, i.e., bankruptcy, the failure of the world's eighth largest economy could and probably would endanger the entire global financial system. If, on the other hand, the US does as the wingnuts allegedly governing California are asking and acts as co-signer on the state's outstanding loans, the credit of the entire US could be undermined and possibly wiped out. California, once one of the most progressive and best-run states in the nation, is largely the author of its own misfortunes; the current troubles had their origins back in the Me Decade, when voters, befuddled by too much dope smoking and/or naked self-interest, used the referendum process to give themselves a big and poorly thought out tax cut. Actually, it wasn't so much poorly thought out as it was maliciously; Proposition 13, which limited property taxes to 1% of assessed value (not necessarily a bad idea in itself) was the brainchild of right-wing "government is the problem, not the solution" forces, and it did its real damage by a) preventing property values from being reassessed until such time as the property is sold, creating the ludicrous (if it weren't so tragic) situation where billionaires can be paying a couple hundred bucks a year tax on a multi-million dollar property just because they happened to buy it before California's real estate boom. Secondly, Prop 13 required that any significant change to the tax code had to be approved by two thirds of either the Legislature or the voting public, with the result that the anti-government crowd, a perennially strong minority in California politics, can short-circuit just about any kind of tax hike or reform. But just as it took a coalition of right-wing ideologues, apolitical greedheads, and left wing space cadets to pass Proposition 13 in the first place, a similar logjam of conflicting but mutually oblivious interests has produced the impasse which may soon force California to slash some of its most fundamental services and start issuing IOUs in lieu of cash payments. The Republican dingbat faction has its fingers in its ears while it chants "La la la, no new taxes" and their Democratic counterparts can only respond with, "But you can't cut THAT program, think of the children/illegal immigrants/endangered lemonthroated warblesuckers...etc." In short, California is burdened, and has been for some time, with a wholly dysfunctional body politic which, if not beyond redemption, is nonetheless unlikely to respond to any conventional remedies. The only way the federal government should even consider becoming involved in this mess is if it effectively nationalizes the state and starts running it direct from Washington. The people of California have demonstrated conclusively and definitively that they're incapable of governing themselves; handing them more money and/or credit would be like furnishing a wild-eyed drunk with another quart of whiskey and a loaded gun.